I am posting this for my good buddy Jesse (DieselHunter) and his wife Jen. Jen drew a calling season tag for 346 after a few years wait. They know this zone pretty well and have hunted it for a few years mostly for elk. Earlier this fall Jesse and me did a pretty intense scouting trip/chicken hunt in order to find where the moose are hanging out and we came up with a promising little spot a aways off the beaten path. Jen was pretty happy to hear we saw some good sign there as she saw a big bull there a year ago too with no tag. 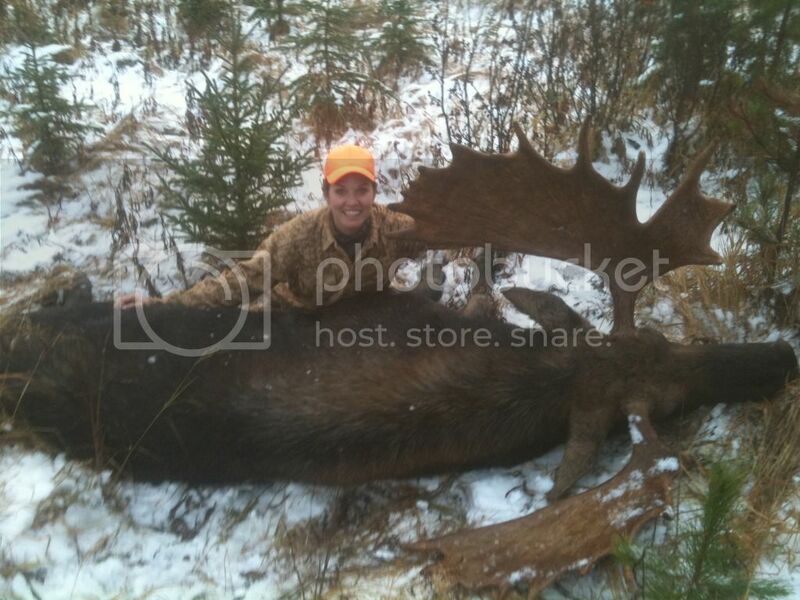 They got out to the spot early this morning and it didn't take Jen long to knock down her first bull moose ever. Her smile in the pics say it all. Jesse and Jen dressed the bull and had him loaded up in no time flat. Jesse, your field dressing apprenticeship is now complete.....lol. It is satisfying to see Jesse enjoying this hunting sport so much after I introduced him to it several years back. He has been in on some awesome trips with great success over the last several years. 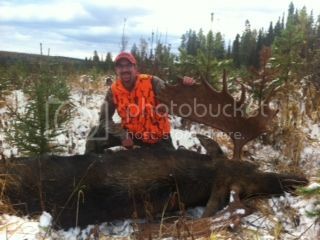 Jen, good shooting and that moose rack will make a great addition to the new lodge. 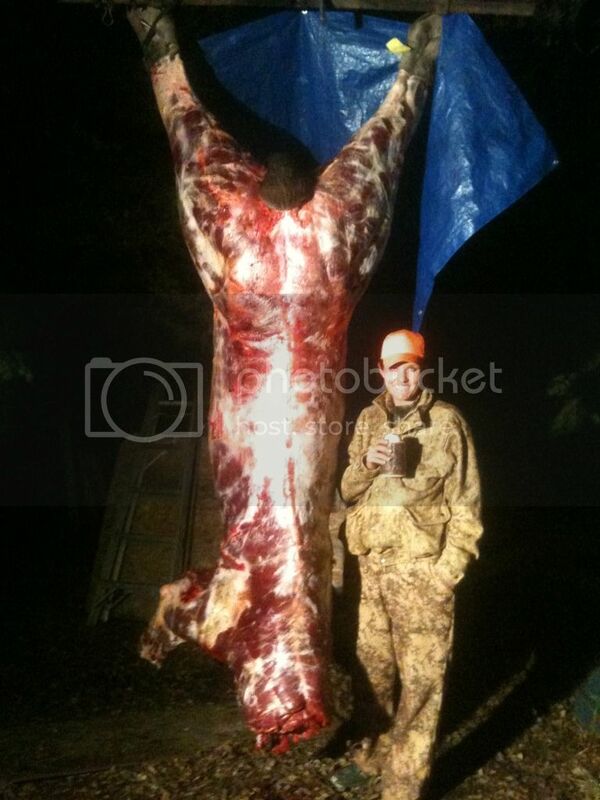 Her bull measured a bit over 48 inches. those are great pictures! 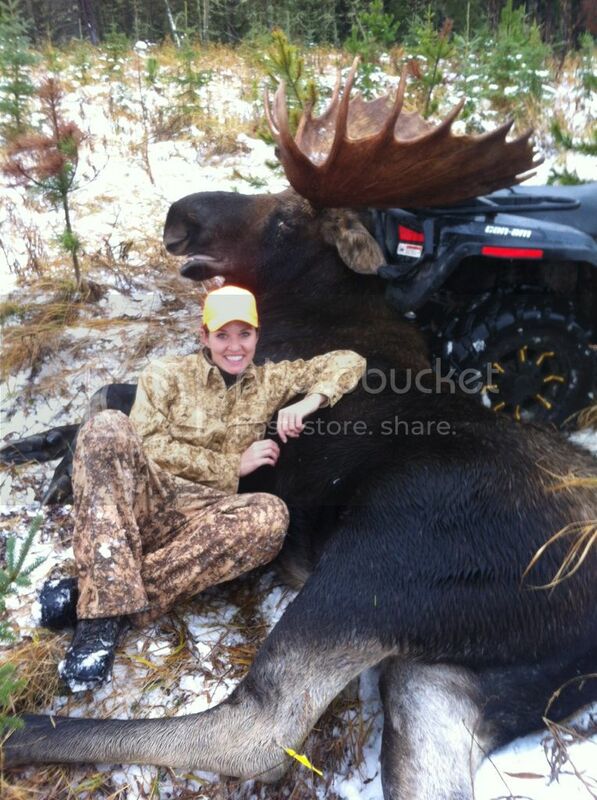 I love seeing pics of other women and their successful hunts!! 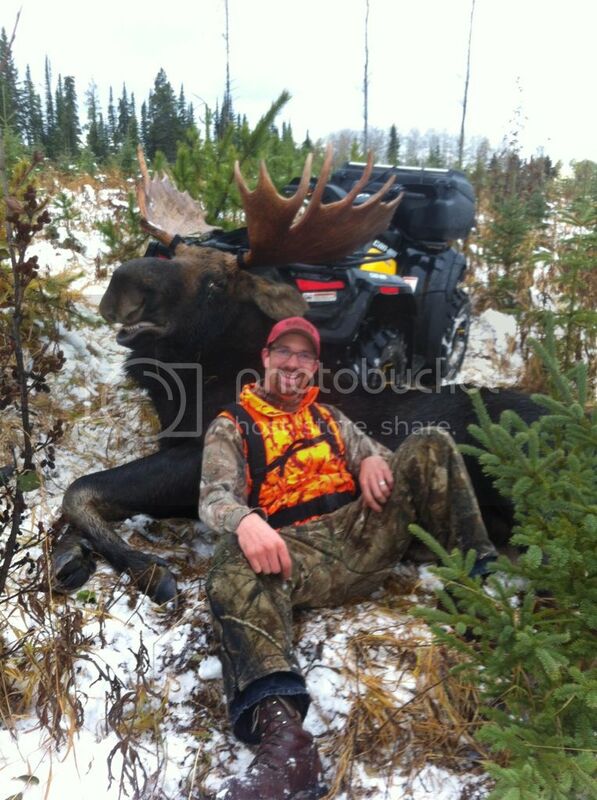 It’s not a good year to be a moose congratulations on the successful hunt. 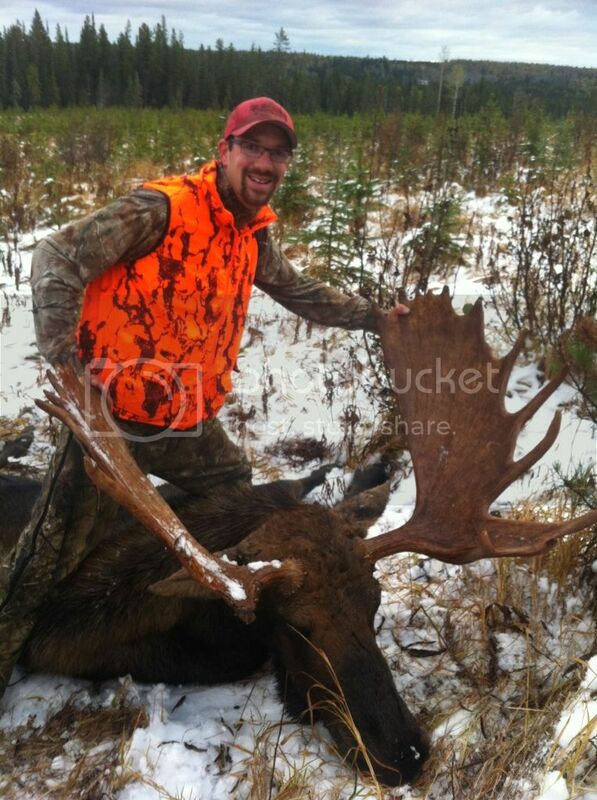 Awesome moose! Tell them Congrats. 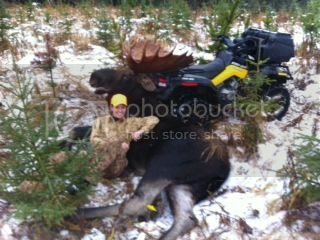 Holy cow thats a nice moose.. Big congrats to the hunters..
Can you see how jealous I am through the screen,, cause I am..
Well done Jesse and Jen ......that is a monster and her smile tells the whole story. Yep, thats a bigger. Congrats Jen! If you want to run with the pack you can't piss like a pup. I saw the moose rack tonite. It is pretty good and heavy, but one front is unfortunately broke off. The bull dressed in at 652 pounds. The story of the hunt is good. Jesse and Jen walked into the cutblock that we know had good sign from an earlier scouting trip. Immediately they scared up 3 whitetails from over a little knoll. Then they heard a cow calling at the edge of the cut. They then heard a bull coming in grunting hard. They just held tight and watched the situation develop. From over the knoll a small bull appeared. Jen steadied the 300 WSM and was getting ready to shoot when Jesse said hang on, there are more moose coming up. Two more smaller bulls followed the first one and then about 50 yards behind them the big guy showed up. Jen put a bullet into the rib cage from about 125 yards. Jesse saw it was a good hit and said hang on, he is done. The big bull walked straight away with the drunk slow walk. He said shoot again only if he turns and gives you a good side shot. The bull walked another few yards and turned. She hit it again behind the shoulder in the ribs. It took two more steps and went down. A nice meat handling job. Atta boy Jesse! Great job and an awsome story.